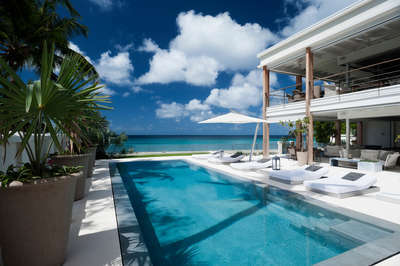 The Michael Gomes designed Coco de Mer villa is one of the finest luxury vacation rental villas in Barbados’ prestigious Sandy Lane Estate. With panoramic views across the crystalline West Coast to the Caribbean Sea, the estate is exquisitely designed for relishing life in the open air. A suspended bridge over a freshwater moat connects the enclosed front garden to the grand entrance foyer. The luminous sitting area evokes a sense of vibrant elegance with colourful accents and furnishings, subtle Eastern influences and a built-in library. A spectacular, collonaded veranda lines the Western edge of the main house, featuring a koi pond and wooden overpass that leads to the al fresco dining area where eight guests can enjoy fabulous feasts at the magnificent coral stone dining table. The luxury gourmet kitchen features quality stainless steel appliances surrounded by marble, warm exotic woods and a breakfast nook with wall-to-wall western windows that reveal a panorama of the sprawling gardens. Ascending from the grand entrance is a curved staircase that leads to the top floor dedicated master suite. This suite features a four-poster king bed, private office, en-suite bathroom with whirlpool bath, sitting area and a private balcony offering vistas of the estate and the Caribbean Sea. There is a breath-taking continuity between the two ground floor bedrooms of the main house and the adjacent garden. When the doors and windows are open, the rich green vegetation merges with the coral stone finishes and neutral colours of the bedrooms and their shared patio. Each of the guest bedrooms has en-suite bathrooms and connects to the entertainment room. 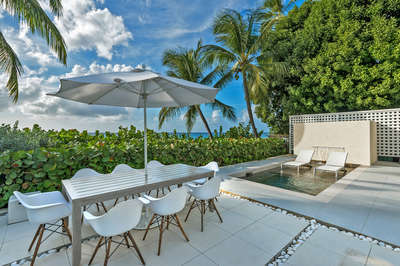 Guests can enjoy a dip in the infinity edge swimming pool, bask on elegant lounge chairs under the shade of umbrellas or dine alfresco on the patio of the one-bedroom guest cottage conveniently located on the pool deck. Coco de Mer is a splendid holiday rental choice for memorable family reunions, outdoor enthusiasts and special events with friends. As of January 01, 2020: Government tax in Barbados will increased to 15%. Access of Sandy Lane Beach Club (beach cabana, chaise lounges, umbrellas, snack bar, washrooms, and showers).